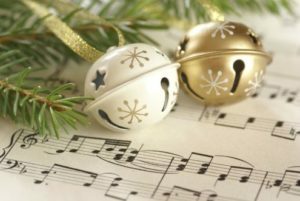 We are joined by singer Lea Gilmore and conducted Edward Polochick for an hour of holiday music, cooking, stories, and more! Beat butter until creamy. Gradually add sugar beating until fluffy. Add eggs one at a time. Blend in flavorings. Sift together flour, baking powder, and salt. Add butter mixture alternately with egg nog and water beating until smooth. Turn into greased and floured 10 inch tube pan. Bake at 350 degrees for 50-55 minutes or until done; cool in pan for 15 minutes. Remove from pan and cool. Glaze and decorate with fruit.